It is known that any amplifier does not only amplify the noise of a signal at its input, but also adds some extra noise (excess noise) to it. This is particularly relevant in the field of optical fiber communications, where fiber amplifiers are used for keeping the signal power levels high enough, and their excess noise can reduce the possible data rate for the accepted bit error rate. In the case of optical amplifiers, excess noise is largely related to quantum noise. Therefore, we first need to learn some basics of quantum noise in optical amplifiers. We first consider the excess noise generated by the best possible kind of phase-insensitive optical amplifier according to the laws of quantum optics. (We do not consider phase-sensitive amplifiers in this tutorial; fiber amplifiers are all phase-insensitive, except for amplifiers based on non-degenerate parametric amplification.) Let us assume that the input signal of such an amplifier has noise at the minimum possible level, i.e., at the so-called standard quantum noise level. Further, we assume that this noise is equally distributed over the two quadrature components, i.e., we do not consider so-called squeezed states of light. In this situation, the noise power at the output of our ideal amplifier, measured in a certain bandwidth, is not only the input noise times the amplifier gain (power amplification factor), but significantly higher due to added excess noise. If the gain is large (e.g. 20 dB), the output noise power is ≈2 times higher than for a hypothetical (but impossible) noiseless amplifier . That additional factor of 2 is called the noise figure. One often expresses that in decibels; the factor 2 corresponds to ≈3 dB. For a lower gain, the excess noise influence (and thus the noise figure) can be smaller. Also, it becomes relatively less important if the input signal already carries a noise well above the standard quantum noise. (Therefore, in multi-stage amplifiers only the noise figure of the first stage is important.) On the other hand, a non-ideal amplifier can have a higher noise figure. A laser amplifier, working with stimulated emission of radiation, can come close to such an ideal amplifier if it uses a pure four-level laser transition and has no parasitic power losses, e.g. from absorbing impurities or light scattering. Its excess noise can be interpreted as resulting from unavoidable spontaneous emission into the amplified mode. Interestingly, even simple attenuation of a light beam by some kind of (linear) absorber or a partially transparent mirror adds some quantum noise. If it would not, we could get rid of the zero-point fluctuations of the electromagnetic field simply by strong attenuation. In reality, however, that zero-point noise must always remain. Any attenuator does attenuate the noise from its input, but it also adds excess noise. In a photon picture, one can interpret this as the random removal of some of the photons; that randomness means noise. In the case of a partially transparent mirror (i.e., a beam splitter), one can also interpret it as vacuum fluctuations coming in via the unused input port. Let us consider what happens if a weak signal at the standard quantum noise level first goes through an attenuator and then through an amplifier. The attenuator will add excess noise such that the noise power stays unchanged despite the attenuation. The amplifier then amplifies all that noise and also adds its excess noise. In the end, we will have substantially more noise than in the original beam. We get substantially less excess noise if we first go through the amplifier and then through the attenuator, essentially because the attenuator then reduces the excess noise generated in the amplifier. In any case, we see that attenuation and amplification cause noise, and that we should avoid attenuation in particular where a signal is weakest – for example, at the input of an amplifier – if we want to minimize the overall excess noise. In part 2, it was mentioned already that most fiber amplifiers, e.g. those using erbium or ytterbium ions, utilize a quasi-three-level amplifier transition. There, we have some signal reabsorption, which clearly increases the excess noise: the absorption itself introduces quantum noise, and the required additional stimulated emission causes more spontaneous emission, which further adds to the noise. That effect becomes more severe for low excitation levels of the laser-active ions, because then the reabsorption is more relevant. Also, it matters mostly whether that effect occurs near the input end of an amplifier, but not much for the output end (if the gain is high), as the excess noise is already strong near the output. 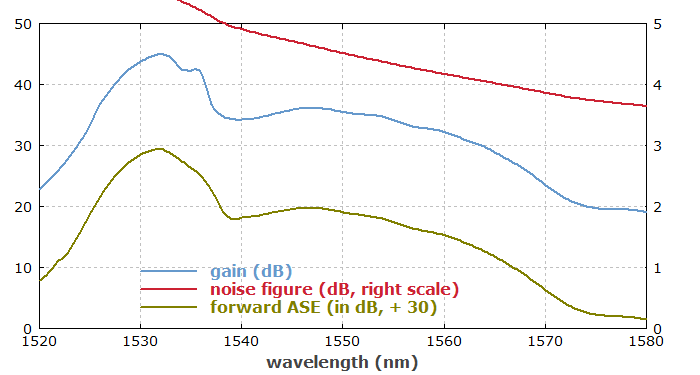 Figure 1: Gain, noise figure and forward ASE spectrum of a forward-pumped erbium-doped fiber amplifier. Figure 2: Same as Figure 1, but with backward pumping. Backward pumping is significantly worse in terms of noise, since in that configuration we have a low degree of erbium excitation near the signal input end. In cases where the disadvantages of forward pumping (e.g. in terms of backward ASE) are too severe, bidirectional pumping can be a good compromise. We also see that the noise figure is substantially higher at shorter wavelengths, because reabsorption by erbium ions in the ground state manifold is stronger there. Other factors are the pump and signal input powers, because these influence the excitation densities. Generally, higher pump powers and lower signal input powers decrease the noise figure. A neodymium-doped fiber amplifier operating in the 1050-nm region would have a noise figure close to 3 dB, virtually independent of the pump direction, pump and signal powers. This is because it uses a four-level transition, and parasitic losses are usually quite weak. Unfortunately, we don't have such four-level amplifiers for the 1.5-μm telecom wavelength region. Additional technical noise can be introduced into a fiber amplifier through its pump source. Essentially, this can be in the form of pump power fluctuations, which lead to fluctuations of the overall excitation densities in the amplifier and thus the amplifier gain. Fortunately, fiber amplifiers are not sensitive to high-frequency power fluctuations, because their upper laser level is typically quite long-lived and serves as an energy reservoir. In case of erbium-doped fiber amplifiers, the upper-state lifetime is particularly long – of the order of 10 ms. This means that pump power fluctuations at frequencies above 1 kHz can hardly have any influence on the amplified signals. Only low-frequency fluctuations can impact the signal, but these are usually quite weak, particularly when a single-mode laser diode with a carefully stabilized pump current is used as the pump source. Also, in optical fiber communications, for example, low-frequency noise is not really relevant for the bit error rate. So it turns out that pump noise is often no problem at all. The situation is somewhat different in cases where a narrow-linewidth seed laser beam is amplified with a fiber amplifier. The fiber does induce substantial phase changes, which are dependent on the fiber's temperature (which itself reacts to pump power fluctuations), vibrations etc. So one might expect that the linewidth of the output could be substantially increased – particularly for high-power sources, pumped with more noisy multimode diodes. This is not true, however, as the induced phase excursions are bounded, i.e., they cannot drift away without any limit. 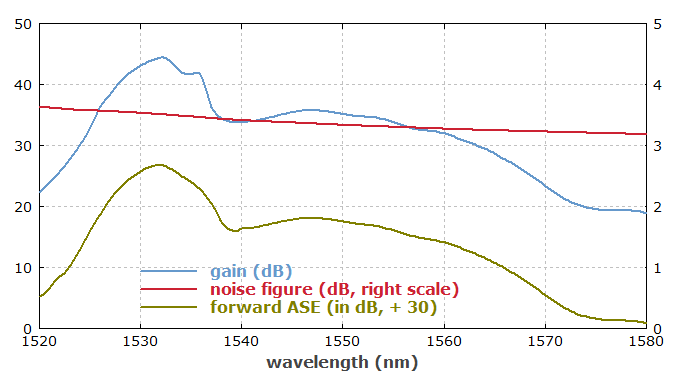 Such kind of phase noise can create side bands, but does not affect the linewidth. Go to Part 10: Multi-stage Amplifiers or back to the start page.